Five Last Minute Halloween Costumes! 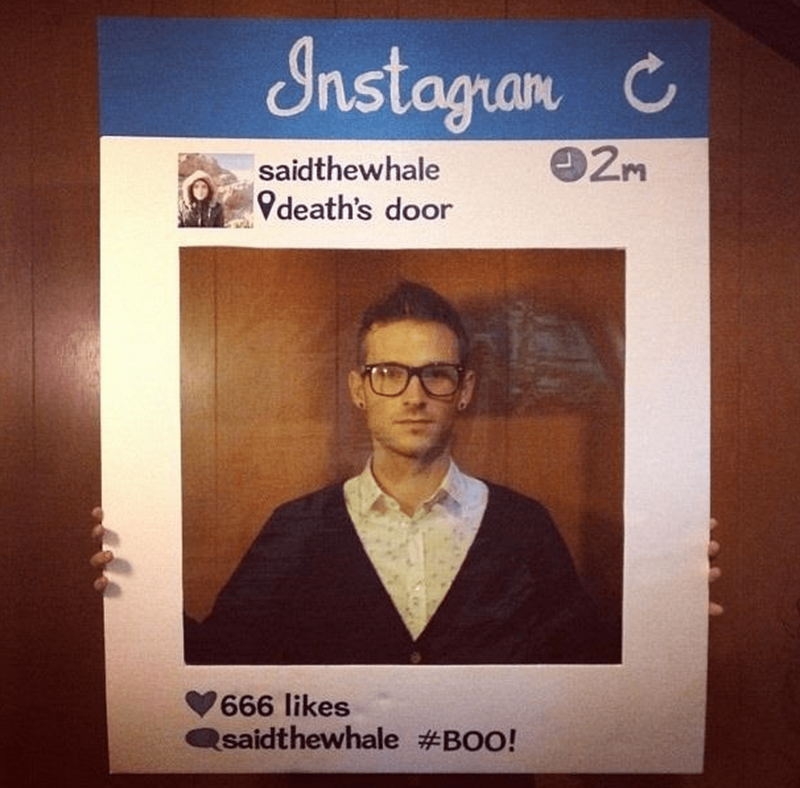 Grab a poster board, print out the Instagram logo, and your profile photo and voila! 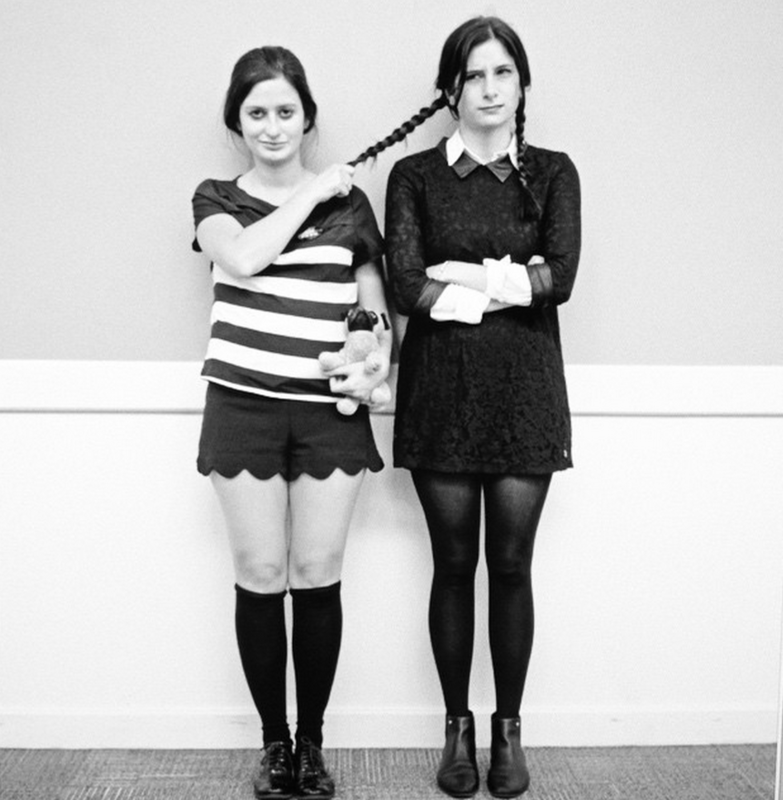 Put on some tights and tie your hair in braids as you emulate the woeful Wednesday Adams! Wanna feel a little frilly this Halloween? 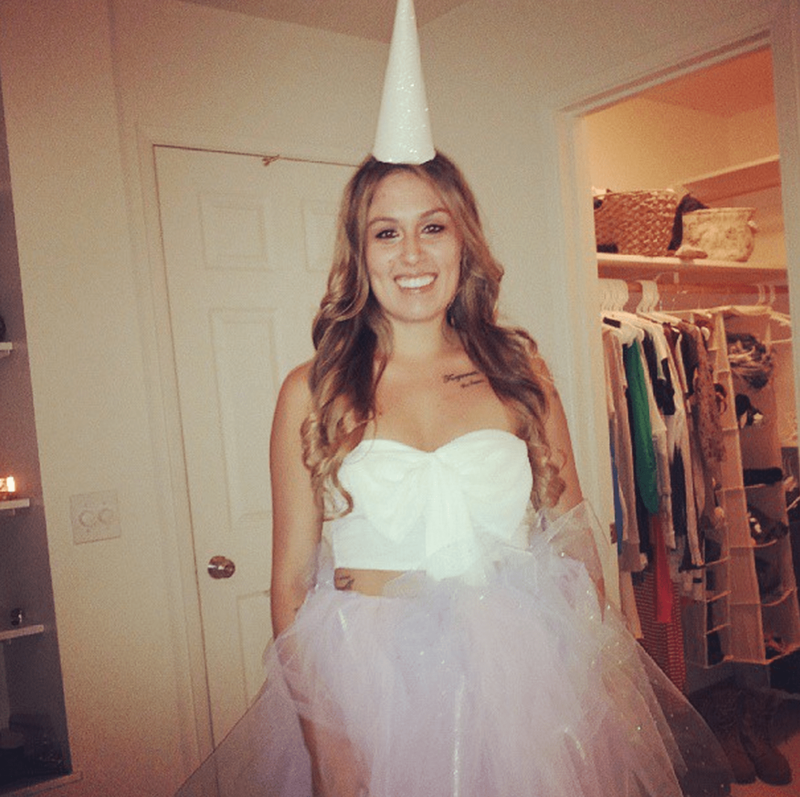 Why not put on a tutu and become a magical unicorn. Hear there’s going to be a chance of rain? 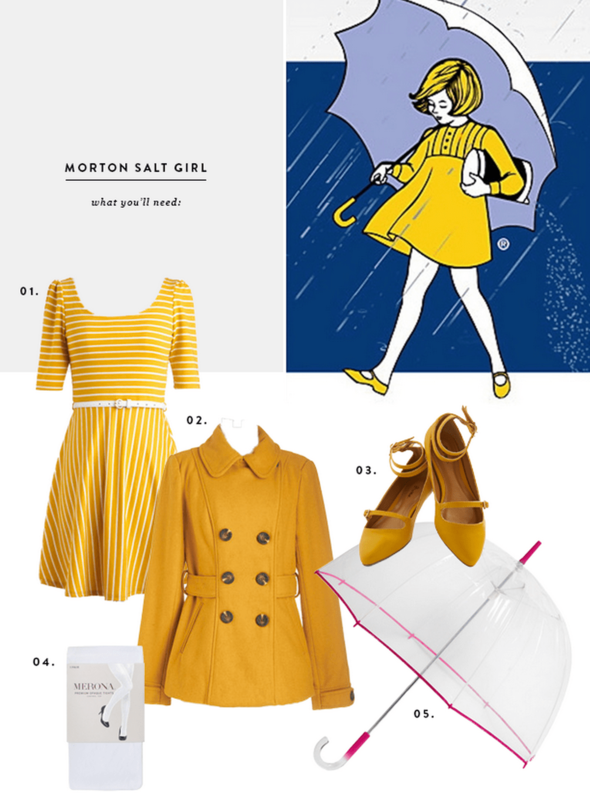 Don on your favorite yellow dress and a bubbly umbrella and be the Morton Salt girl! Give your friends the silent treatment tonight with a stripped tee and your best mime moves. What costume will you be donning this Halloween? Share with us in the comments below, or on Facebook and Twitter! Looking to spend a relaxing weekend on the ice? Or would you rather go crazy on a haunted pirate ship, or take a time machine to the 1930’s? For a Spooktacular weekend, ABCey Events has got you covered! It’s everybody’s favorite topic of the week: ABCey’s Weekend LineUp! Want to take a trip to the past this Halloween weekend? 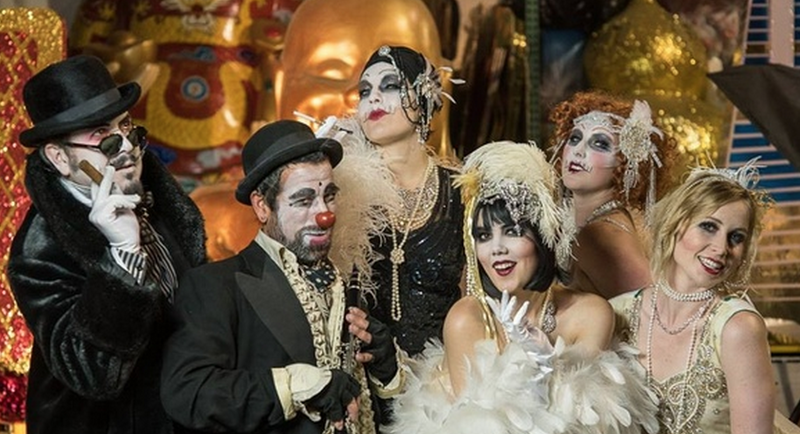 With a multi-evening experiential destination party, the San Francisco Spookeasy Halloween Extravaganza is taking a a daring and sophisticated spin on Halloween! Located at Chinatown’s Great Star Theatre, the event will take on the Burlesque and Vaudeville era of the 1930’s in a decadent Prohibition-era Speakeasy! Zombies, brain dissection, and a dive show?! What more can you ask for to kick off an amazing Halloween Weekend? Stop by the Bay Area Science Festival for an evening of delight and disgust, including an education on the science the behind of vampires, zombies, and other monsters that go bump in the night! Buckle in your strait-jacket and commit yourself to the Asylum! Why not spend this Halloween at the 7th annual Ghost Ship 2014. Strap yourself in for a wild ride and dance the night away this Halloween at Pier 70! Tis the season! Yet again. Kick off the Holiday season, the day after Halloween, by spending a leisurely Saturday on the ice at the Union Square Ice Rink! 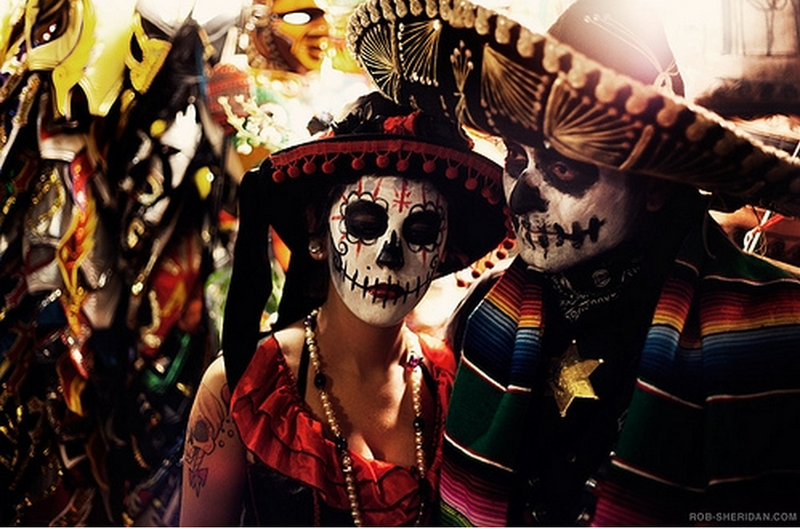 Put on some face paint and join the other deathly figures and make your way down the streets of the Dia de los Muertos Procession and Festival in celebration of lives now gone. The festival features six local groups which have commissioned large-scale community altar installations and over 75 personal altars! (Don’t forget to bring candles, flowers, photos, mementos, food, or drinks to place on the altars). What will you be doing this weekend? Tell us about your plans in the comments below or on Facebook and Twitter! So you’ve sent out the invitations for your awesome Halloween event, but Halloween still managed to sneak up on you this year? Don’t worry because ABCey has you covered with these 5 Last-Minute Halloween Event Decor Ideas! Add some color to your party this Halloween with these crafty Melted Crayon Pumpkins! All you need is a white pumpkin, crayons, and a hairdryer to get this psychedelic effect! Light up your Halloween event with these Ghoulish Lanterns! What other faces can you come up with to draw on this creative decor? These adorable Mason Jar Mummies might look complex, but don’t be fooled, they only require 4 materials to get the job done! Watch as your guests get squeamish as they reach for this tasty Watermelon Brain. Would you dare to take a bite? Probably the easiest of the bunch, the Foil Portrait provides a creepy, ghostlike profile of your loved ones in a matter of seconds with materials you already have at home! Which one of these last-minute Halloween event decor ideas will you be trying? Let us know in the comments below or on Facebook and Twitter! Event planners now have a new option to gather feedback from attendees with Beyond Verbal’s Moodies, an app that records user’s voice and then analyzes various elements, such as energy, timing, pitch, and volume to determine the person’s emotional state. Moodies can detect 11 different moods in a 20-second response using Emotions Analytics which is a compilation of mood, attitude, and personalitites. Did we mention this technology has been tested on more than 10,000 people around the world, so the app works across languages and cultures. Why We Love Moodies: Beyond Verbal’s Moodies can be used throughout the event to watch the ebb and flow of guests’ reactions to various portions of the production. Not only can it provide valuable data about guests, but also about events’ speakers which can ensure they are conveying the right mood to their audience. This app could revolutionize feedback and provide valuable information for event planners! Would you use Beyond Verbal’s Moodies at your next event? Let us know in the comments below or on Facebook and Twitter! This week, we want to introduce you to Songhop, a startup located in Palo Alto. Songhop was recently launched and offers “the world’s first active music discovery software.” Users can browse through dozens of songs and decide whether they like them or not. Songhop also helps new artists gain recognition in the midst of the mainstream. How it works: The interface is very simple. Sign up and start listening to songs right away! If you sign up with a social network account like Facebook or Twitter, you can see what songs your friends like. Start exploring songs that are categorized by genre, or check out your friends’ favorites. As soon as you play a song, Songhop provides you with three options. Click the “X” if you don’t like the song or the heart symbol if you like it. You can also share the song via message or social network. Why we love it: Songhop enables you to broaden your musical horizon! Discover new music you would have never heard otherwise, or help new artists to find success. Are you planning on throwing a country themed event, but your knowledge of country music barely exceeds Taylor Swift or Brad Paisley? Use Songhop to discover more! Best of all, Songhop is free, and free is good! Would you use Songhop? Tell us what you think about the world’s first active music discovery software in the comments below or on Facebook and Twitter. Any business professional should know how to manage customer relationships and event planners have a unique perspective on these. ABCey has outlined five insider tips to help improve customer relationships and motivate your customer base to choose you over the competition! As event planners, we are often in a rush to satisfy our customer’s needs quickly and present preliminary results as soon as possible. However, rushing in order to satisfy the customer could impact the results and the quality of our work negatively. When all is said and done, most customers remember how competently and accurately we did our jobs and prefer that we are knowledgeable and precise rather than fast. In fact, a recent Gallup study revealed that the number one reason customers leave a service is because they feel too rushed. Very few people have stated they have left a service because it was too slow. When it comes to events, always make sure to promise your customers a good experience rather than an inexpensive service! Customers feel better about a brand or a service if they feel like their time was well spent. They will most likely chose a service that guarantees their event to be a success and a great experience, no matter how inexpensive your service is compared to others. Most people favor memories of good times over memories of great savings. Offering basic packages is easy. Often, the small differences help your service or brand stand out. Surprise your customers with unexpected extras and put additional effort into your work. Your customers will notice additional benefits and pay more if they feel comfortable with your work. They are also likely to be repeat customers in the future, because they will remember little extras you offered in your service. Offer your customers a loyalty program and they will stand by your brand. When you start a loyalty program with a first-time customer immediately, they are more likely to come back and finish the program. You could offer a 10% discount to repeat customers or offer discounts for referrals. There are many ways to reward loyalty! Be creative and have be open to suggestions and ideas. Persuade your customers of the value of your service or brand by sharing brand-related stories or anecdotes. Past researches have shown that storytelling is one of the most persuasive forms of communication, whether in verbal or non-verbal from. If we can connect our service or brand to a story, we convey lasting messages in our customer’s mind, because they build relevant connections. Therefore, storytelling enables us to leave a powerful impression on our audience. What valuable lessons have you learned from your customers? Tell us about in in the comments below or on Facebook or Twitter! Whether your interested in a leisurely weekend of pumpkins and painting, or looking to have some fun with cocktails and a lunar eclipse, ABCey Events has got you covered! It’s everybody’s favorite topic of the week: ABCey’s Weekend LineUp! 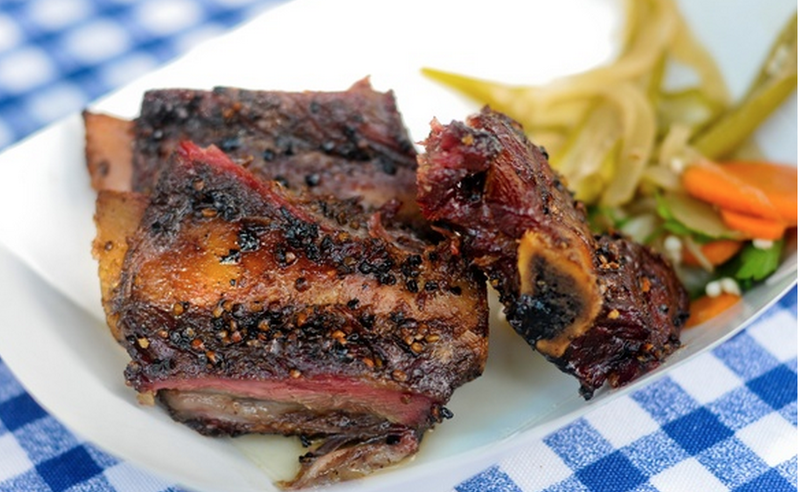 Want a relaxing evening with friends, drinking beers and exploring new foods? The then Off the Grid: Presidio is the place to be. Kick back and enjoy the nice weather with lantern-lit dining cabanas, cabana style cocktail service, fire pits, and live music! 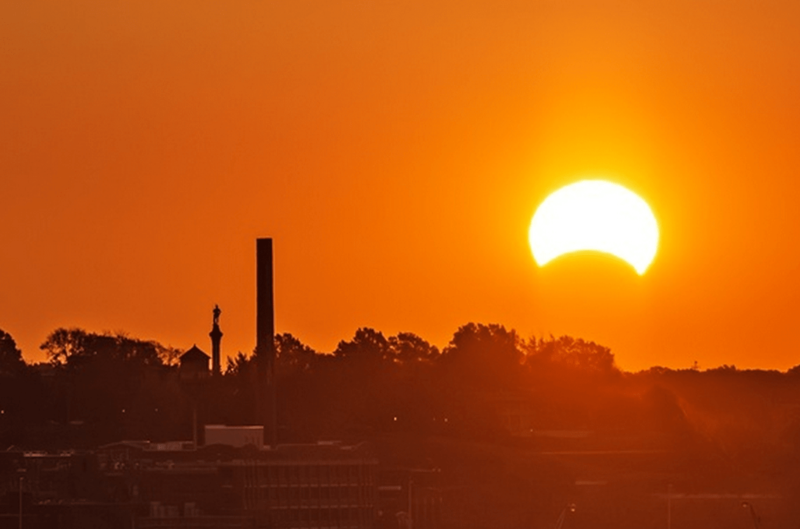 Did you know there’s a solar eclipse today? What better way to celebrate this natural marvel than in style with the California Academy of Science’s Nightlife. Enjoy some cocktails, solar eclipse DIY projects, live music, and much more at the California Academy of sciences, tonight! Looking for a mellow Halloween gathering before the big event next week? Night enjoy a bit of paint and wine at the Beyond Canvas Studio in the Mission. Get a little tipsy while creating an easy to do (instructed) step by step ghoulish masterpiece! Want a side of comedy with those eggs?! Join Cafe Royale this weekend for a bunch of brunch favorites: bacon, eggs, and did we mention mimosas with the added bonus of some feel good stand up comedy! Looking to get a little more mileage out of that Halloween costume this year? Why not stop by Treasure Island’s monthly flea market with the added bonus of enjoying a pumpkin patch, vintage costume shopping, and did we mention 2 for 1 cocktails! In this era of social media and online marketing, nothing is more important than valuable online content to get your brand’s name out there. Especially as event planners, we want to spread our events out the world. A wide online presence helps you reach a large audience. ABCey introduces you to the 4 types of content that increase brand awareness and help you to establish your brand in the market. Blogs are a great way to provide your customers with information about your service or product. They are free and give customers an idea of what you offer. It’s even better if you provide your audience with more than just information about your own brand, but include informative news about the industry you’re working in. This way, you turn your blog into a regularly visited destination for your audience. Depending on the value you provide, people might even share your blog on social media, which helps increase brand awareness. Most people check their emails on a daily basis, which makes an email newsletter a great way to increase brand awareness. It is time efficient and cost effective! Email newsletters are a great way to promote your events as well! An informative email addressed to all people on your subscription list updates your audience about news regarding your brand, industry, or events. Reaching out to your audience illustrates your engagement and that you care about them. However, too many emails might come off as too spammy and people might unsubscribe soon. Therefore, send your email newsletters just once a week or on a bi-weekly basis. Images make your content more compelling. Whether they are on your website, in your blog, or in email newsletters – always include some relevant images! Texts without images look boring and are likely to be skipped by people. Using images also helps you create a certain atmosphere that might be relevant for your brand. Bestow your brand with a serious, funny, or playful vibe to attract potential customers. In addition, use a brand logo to establish recognition value in your industry. It is important that your logo is consistent and always looks relatively the same, otherwise your audience could get confused. Studies have shown that customers who watch videos about a product or service, feel more confident about purchasing it. Creating videos might be a little bit more work than all of the above, but it’s worth the effort! An artistic or eye-catching video will likely be shared on social media by your customers and therefore reach a larger audience. Make your video go viral on Youtube with a strong message that helps you to increase brand awareness. If you are an event planner, why don’t you post some clips of previous events to give your customers a taste of your great work? No matter which type of content you use, all of them demonstrate engagement with your audience. Include a “call to action” in order to establish interaction between you and your customers. What is your advice on how to increase brand awareness? Tell us about it in the comments below or on Facebook or Twitter! 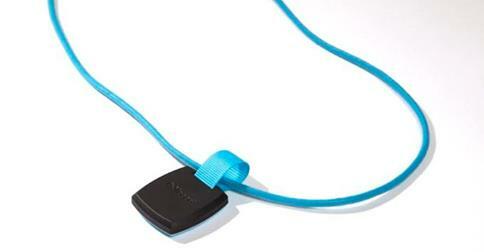 Loopd, an event marketing wearable, provides personalized data to enhance your event strategy using the Loopd badge. By simply downloading the Loopd app, everyone at your event – guests, clients, vendors, planners, and you – can receive real-time data and analytics about your guests and event on your mobile devices! Loopd caters to everyone at your event! The event marketing wearable allows the event’s exhibitors to identify and collect leads automatically while attendees can use the app to connect with others and trade information in place of business cards. The app will remember when and where guests connected so there will never be any of those awkward re-meeting conversations again! Why We Love Loopd: Loopd is perfect for event planners, clients and attendees! It works in real-time by measuring traffic flow throughout the event and can significantly improve marketing campaigns because it shows what guests are most interested in. Not only that, but all of its valuable insights is provided in easy-to-understand analytics. This device is well-rounded and perfect for event planners! Would you use Loopd? For what type of events? Let us know in the comments below or on Facebook and Twitter! From short films to craft beers, San Francisco October 16 – 19, 2014 is full of events to see, taste, and hear! ABCey’s Weekend LineUp will reveal the most bumping beats and tastiest treats for you to enjoy this weekend. If you love short films, this three-day event is for you! 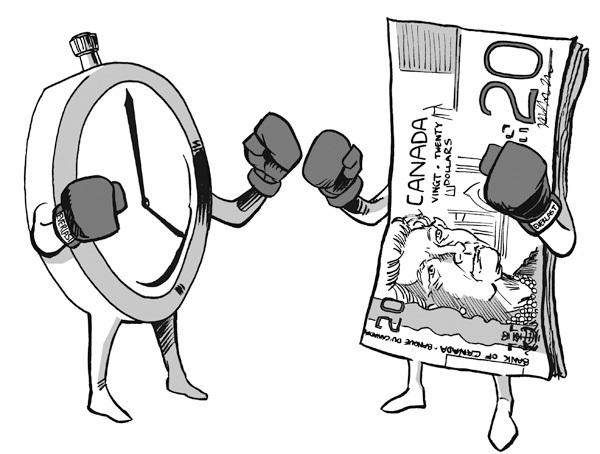 All shows are 30 minutes or less and cover topics ranging from sacrifice to identity. Start planning with the schedule here. This family friendly event offers endless amounts of fun with a Costume Contest for pets and kids, a pumpkin patch, face painters and live music on two stages! 75 breweries with 150 different beers will be ready for tasting at this year’s SF Craft Beer Festival – Fall Harvest! With unlimited 2 oz tastings of this extensive variety from breweries all over the United States, which will be your favorite? Head over to Treasure Island for this two-day music festival which will include live music, gourmet food, and fun activities! The 2014 lineup includes Janelle Monáe, Zedd, Massive Attack, and Outkast! Haight Ashbury has the largest number of Victorian houses in all of San Francisco and this Sunday, you have the chance to enter and explore these quintessential SF houses throughout a 9-block radius! Which event will you be attending in San Francisco October 16 – 19, 2014? Let us know in the comments below or on Facebook and Twitter!